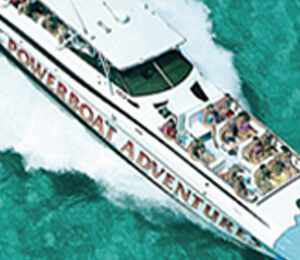 Climb aboard our high speed powerboat for the most exhilarating voyage of your life. Experience the rush of adrenaline as you depart Nassau for the secluded Exuma Cays. You'll need to hold tight to your seat as our boat slices through the cerulean Bahamian waters at over 40mph to transport you to remote pristine islands. In the Exumas, you will view coral gardens as you snorkel in the crystal-clear waters, and feed wild stingrays, sharks and iguanas... all the while surrounded by some of the most awe-inspiring panoramas on earth on your very own private island, Ship Channel Cay. The towering landmark of the Atlantis Resort fades into the horizon as we leave for the first stop on the tour the remote oasis of Allan's Cay. This pristine island is home to the critically endangered Allen's Cay Rock Iguana (Cyclura cychlura inornata). This protected species of lizard, called the Bahamian Dragon by locals, will happily approach our party for a tasty treat of grapes. Be sure to snap some photos of this ancient species. Powerboat Adventures is pleased to provide transportation to this island for ecologists, marine biologists, and environmental researchers in order to assist in the effort to study and conserve this threatened species. After saying farewell to our reptilian hosts, enjoy the thrill of the trademark Miami Vice high-speed ride to our ultimate tour destination, the secluded island paradise of Ship Channel Cay. After arriving on the soft white sand of Ship Channel Cay's pristine beaches, meet the friendly inhabitants of the shallows, the stingrays. These gentle creatures love to be hand fed and don't mind an occasional tickle on their silky skin.The free lunch attracts another resident of these waters, the sharks. The stingrays will disperse as nurse, reef and lemon sharks arrive to be fed by our guides. Visitors have the opportunity to click some photos of these incredible predators. If you are brave enough, you can even try some underwater photography. This exciting encounter certainly explains why our tour has been featured on both the E! Television Network and the Discovery Channel. Enjoy drift snorkeling around the spectacular reefs, teeming with coral gardens and marine life. While you feed the rays and snorkel, we are busy cooking up our secret fish stew, made with fresh island grouper and a range of closely guarded spices. Served along with fresh salads, tasty breads, chargrilled steak, tropical fruit platters, chips, dips and other delights, you're sure to find something to satisfy your tastebuds. We'll accommodate diners with special dietary needs. Also, enjoy our open bar, available to you for the entire day. Our island have seemingly endless beaches of soft white sand, gently washed by crystalline waters. Whether you're looking for a wonderfully romantic walk on the shoreline, a refreshing swim, or a relaxing rest in a sun lounger with your toes splashing in warm waters, it's here.